Thank you for your interest in our GMP Newsletter. The ECA Academy's GMP Newsletter is a free service. 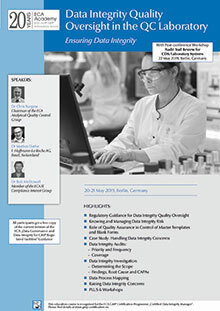 Sent on a weekly basis, the Newsletter informs you about the latest developments and trends with regard to GMP/FDA Compliance topics. Have a look at the current GMP Newsletters . If you wish to subscribe to the Newsletter, please indicate below which topic you're most interested in. Moreover, you can also subscribe to our special Newsletters dedicated to pharmaceutical development (authorisation / GCP / clinical trials) and/ or to Regulatory News. These Newsletters, sent at irregular intervals, are also free. Please indicate your e-mail address, academic title, name and surname and confirm your registration with the "send" button. Please note that you can unsubscribe Newsletter any time under this link.